This chapter is a brief introduction to the satellite and its instruments, and is intended as a simplified guide for the proposer. Reading it thoroughly should provide the reader with the necessary information to understand the capabilities of the instruments at a level sufficient to prepare the feasibility section of an Suzaku proposal. In its first year of operation, Suzaku has accumulated data from calibration, SWG and GO observations. The list of all observations performed is available at . Figure 2.1: The 96 minute Suzaku orbit. Suzaku is in many ways similar to ASCA in terms of orbit, pointing, and tracking capabilities. Suzaku uses the same station (USC) as ASCA did for uplink and downlink, although downlink at NASA DSN is not possible with Suzaku (see footnote in subsection 2.2.2). As a result, the operational constraints for Suzaku are also similar to those of ASCA. 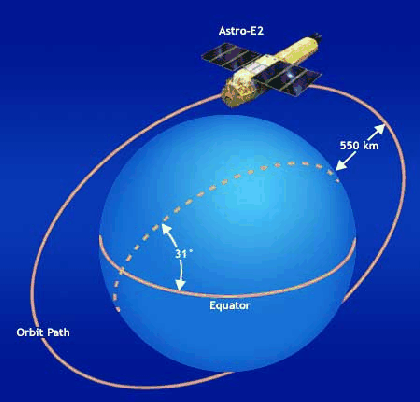 Suzaku is placed in a near-circular orbit with an apogee of 568 km, an inclination of 31.9 degrees, and an orbital period of about 96 minutes. The maximum slew rate of the spacecraft is degrees/min, and settling to the final attitude takes minutes, using the star trackers. The normal mode of operations will have the spacecraft pointing in a single direction for at least 1/4 day (10 ksec; but see ``raster-scanning'' in section 2.2.1). With this constraint, most targets will be occulted by the Earth for about one third of each orbit, but some objects near the orbital poles can be observed nearly continuously. The observing efficiency of the satellite as measured after a year of operation is about 45%. 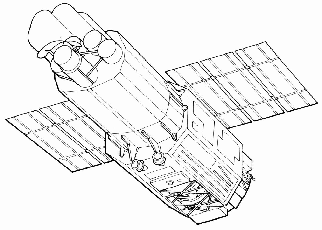 Figure 2.2: [Left] Schematic picture of the bottom of the Suzaku satellite. [Right] A side view of the instrument and telescopes on Suzaku. The scientific payload of Suzaku (Fig. 2.2) initially consisted of three distinct co-aligned scientific instruments. There are four X-ray sensitive imaging CCD cameras (X-ray Imaging Spectrometers, or XISs), three front-illuminated (FI; energy range 0.4-12 keV) and one back-illuminated (BI; energy range 0.2-12 keV), capable of moderate energy resolution. Each XIS is located in the focal plane of a dedicated X-ray telescope. The second instrument is the non-imaging, collimated Hard X-ray Detector (HXD), which extends the bandpass of the observatory to much higher energies with its 10-600 keV pointed bandpass. The X-Ray Spectrometer (XRS) is no longer operational, and will not be discussed further. Interested readers are invited to access the XRS instrument paper at . All of the instruments on Suzaku operate simultaneously. Each of the co-aligned XRTs features an X-ray mirror with an angular resolution (expressed as Half-Power Diameter, or HPD) of (cf. Fig.2.4). Figure 2.3 shows the total effective area of the XIS+XRT, which includes features due to the elemental composition of the XIS and XRT. K-shell absorption edges from the oxygen (0.54 keV) and aluminum (1.56 keV) in the blocking filters are present, as well as a number of weak M-shell features between 2-3 keV arising from the gold in the XRT. The four XISs (cf. Fig.6.2) are true imagers, with a large field of view ( ), and moderate spectral resolution. 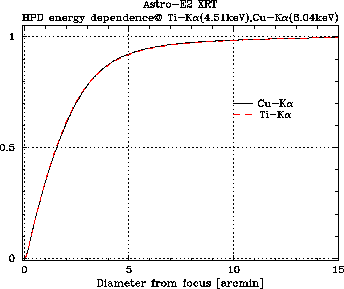 Figure 2.4: The Encircled Energy Function (EEF) showing the fractional energy within a given radius for one quadrant of the XRT-I telescopes on Suzaku at 4.5 and 8.0 keV. The HXD (cf. Fig.7.1) is a non-imaging instrument with an effective area of cm , featuring a compound-eye configuration and an extremely low background. It dramatically extends the bandpass of the mission with its nominal sensitivity over the 10 - 600 keV band (cf. Fig.2.5). The HXD consists of two types of sensors: 2 mm thick silicon PIN diodes sensitive over 10 - 70 keV, and GSO crystal scintillators placed behind the PIN diodes covering 40 - 600 keV. The HXD field of view is actively collimated to by the well-shaped BGO scintillators, which, in combination with the GSO scintillators, are arranged in the so-called phoswich configuration. At energies below keV, an additional passive collimation further reduces the field of view to . The energy resolution is 4.0 keV (FWHM) for the PIN diodes, and % (FWHM) for the scintillators (where is energy in MeV). The HXD time resolution for both sensors is 61 s. While the HXD is intended mainly to explore the faintest hard X-ray sources, it can also tolerate very bright sources up to Crab. The HXD also performs as an all-sky monitor (the Wide-band All-sky Monitor (WAM), which can detect GRB and other sources. Although observers will receive data from the WAM, it cannot be proposed for directly and has special rules regarding data rights; see Chapter 3. 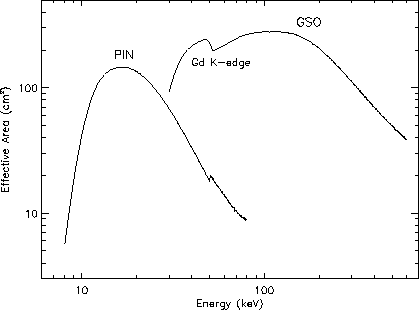 Figure 2.5: Total effective area of the HXD detectors, PIN and GSO, as a function of energy. Because the HXD bore-sight axis, with the highest effective area, is about 3.5 arcmin shifted from that of the XISs, Suzaku supports two aimpoints, XIS and HXD oriented. Users are requested to select which pointing axis is best for your observations. For the XIS, choosing the XIS aimpoint provides a larger XIS effective area than the HXD aimpoint. Conversely for the HXD, the HXD aimpoint provides a larger HXD effective area than the XIS aimpoint. Note that a 10% increase in effective area corresponds to a 20% increase in observing time for background dominated observations. For source dominated observations, the effect is 10%. Please take into account these effects in your observation plan. While a substantial change of the spacecraft attitude (more than a few degrees) is time-consuming, small offsets can be made efficiently. Such offsets would require that no new stars need to be acquired by the star trackers, and thus are limited to . This is particularly useful in checking for point sources that in the HXD FOV but outside the XIS FOV. The minimum total time is still 10 ksec, and each point in the raster scan must be observed for at least 3 ksec. Raster-scanning observations over a regular grid can be specified as a single target with multiple observations. In this case, use the Remarks section to specify the details of rastering (such as "use 3 x 3 grid separated by 15 arcmin each"). For irregularly spaced pointings, the PI must specify each as a separate target with its own coordinates. If the raster-scan pattern is complex or unusual, PIs are encouraged to contact the Suzaku team at ISAS/JAXA or the NASA Suzaku GOF for assistance before submitting a proposal. Suzaku carries a 6 Gbit data recorder. Data will be downlinked to USC at a rate of 4 Mbps for a total of 2 Gbits per pass, up to 5 times a day. This allows a maximum of 10 Gbits of data to be obtained per day, but fewer passes may be available to Suzaku as it will share the use of USC ground station with other ISAS satellites2.1. Data can be recorded at 4 different rates: Super-High (524 kbps), High (262 kbps), Medium (131 kbps), and Low (33 kbps). The recording rate will be changed frequently throughout an observation, according to a sequence that will be determined by the operations team at ISAS. This is to optimize the selection of the data rates and the usage of the data recorder, taking into account the expected count rates supplied by the proposers. Thus an accurate estimation of the count rates is important for the optimization of the mission operation. We emphasize that proposers cannot arbitrarily choose the data recording rate. On-source data will usually be recorded at High (during contact orbits, during which the satellite passes over USC) or Medium (during remote orbits, without USC passes) data rate. The Low rate will primarily be used for times of Earth occultations and SAA passages, as the background rates in the XIS and HXD exceed their telemetry allocation limit at Low data rate. The telemetry limits for the XIS are presented in Chapter 6. The XIS data mode will be chosen for each data recording rate used to prevent telemetry saturation, based on the count rate supplied by the proposer. 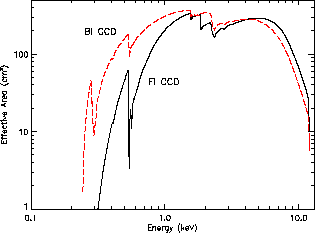 Studies of diffuse soft X-ray sources with low surface brightness: the low background, soft X-ray sensitivity, and near-Gaussian response of the XIS BI CCD makes such targets an excellent use of Suzaku. Observations requiring sensitivity both above and below 10 keV, especially measuring the Fe K complex simultaneously with the hard ( keV) continuum. Studies requiring primarily high spatial resolution. Chandra's PSF is smaller than Suzaku's, while the XMM-Newton PSF is smaller. Studies requiring primarily high spectral resolution. The gratings on Chandra and XMM-Newton have significantly higher resolution than the XIS. Calibration observations for Suzaku started 4 weeks after the launch. The list of all calibration targets done during Phase-1A can be found on the Suzaku websites listed in Appendix C.
Table 2.2 summarizes the calibration items of all scientific instruments, the current status, and their expected and measured accuracy. Note All the values quoted are preliminary. b: For all integration radii from 1 -6 . No error on attitude control is included. c: As on-axis but for all XIS f.o.v. No calibration is currently scheduled. d: For the normal mode data. Uncertainties of the energy scale increase when the burst and/or window options are applied. e:When xisrmfgen is used. Note that an error of 5% in the energy resolution could produce an artificial line width of as large as 25 eV in sigma at the iron band. Energy resolution with the spaced-row charge injection is under investigation. f:Uncertainty represented as the carbon-equivalent column density. Valid only at the center of the field of view. g: Modeling accuracy depends on energy-band and exposure. See Chapter 7 for detail. Presented are example for 15-40 keV with 100 ks (PIN),and 50-100 keV with 100 ks (GSO), with rev1.2 BGD modeling. Study continues. h: The Crab and PSR 1509 pulses are clearly detected in the quick look analysis of calibration data. These values are the 90% limits, equivalent to . Note that the values listed are those required from the scientific purpose and ultimate goals which are possible to be realized on the basis of the instrument design.